Add The latest The HPE 10GbE Pass Through Module switch with 16 ports plug -in module with Bandwidth performance 320 Gbps for c-Class BladeSystem. 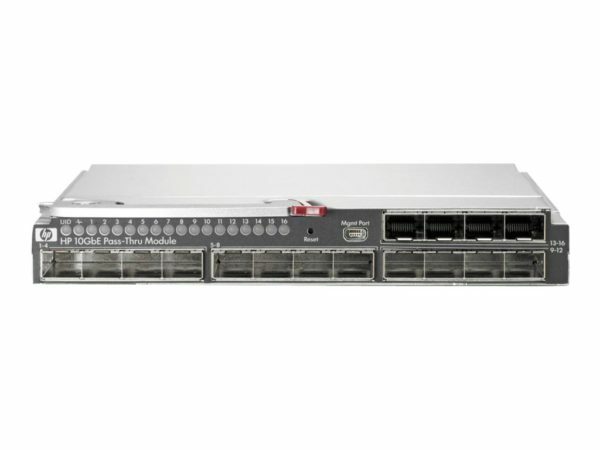 The HPE 10GbE Pass Through Module switch with 16 ports plug -in module allows Multiple direct server-to-network connections. The HPE Pass Through Module switch can auto-sense 1Gb or 10Gb operation on a port-by-port basis. The HPE 10GbE Pass Through Module switch Supports standard Ethernet as well as Converged Enhanced Ethernet. With The HPE 10GbE Pass Through Module switch no management is required and Module performance can be monitored.